- 1 day admission to Australia Zoo: 14 wildlife shows daily, including the Australia Zoo Wildlife Warriors Show in the world famous Crocoseum. 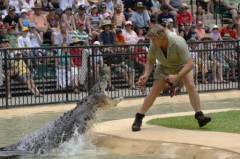 Australia Zoo, one hour north of Brisbane on the Sunshine Coast, is home of the Crocodile Hunter Steve Irwin. Nestled on 105 acres and with over 1,200 native and exotic animals, it's the most interactive wildlife adventure and conservation destination on the planet. Check out giraffes, rhinos, zebras and cheetahs at the African Savannah, and majestic tigers and red pandas in South-East Asia. Visit Bindi's Island, where you can explore a three-storey treehouse with sweeping views of Australia Zoo, and see ring-tailed lemurs, giant Aldabran Tortoises, colourful macaws and more! Watch the world-famous Wildlife Warriors show at noon, with all the slithering, swooping, jaw-snapping action of saltwater crocodiles, birds and snakes LIVE in the Crocoseum. Explore one of the world's busiest Wildlife Hospital, where you can watch vets saving endangered Australian animals. Opening Hours: Open 7 days a week (except Christmas day) from 9:00am to 5:00pm. Children and infants must be accompanied by an adult. Child: 0-14 years inclusive - free of charge travelling with adult. Age restrictions apply to most animal enclosures and therefore children will not be able to participate in all aspects of the tour. - Concession rate applies to students and pensioners only. Valid/official student and pensioner cards must be presented upon entry.